Do you know what's going on in this picture? John sent it to me to ask if I could help him date the dress the woman is wearing (looks pretty early-1930s to me, or else set WAY in the Art Deco Future), but I'm so intrigued by everything going on in this photo (the box! the altar! the little-girl pages with swords! the priest!) that I asked him if I could post it and set y'all loose on the problem. The photo above is pretty small; if you want to download a REALLY BIG one, that you can enlarge to see the detail on the box (a reliquary? an offering of some sort? a time machine?) you can grab it here. [UPDATED: here's a closeup of just the box. My first thought was perhaps the woman was taking vows of some kind (to become a nun, or to join the Space Vestals — I'm sorry, I can't pull myself away from that Art Deco Future) but John thinks that novices usually didn't wear so much makeup. Or so much velvet. What do you think is going on? If you KNOW, that's wonderful, but in the meantime, idle speculation is encouraged. Theresa, I don’t think this is a Knights of Columbus ceremony. I don’t see any knights in the picture. ” ChaudiereNoire said… The class of ’42 also featured Patricia (Kilkelly) Kiester, and Mary Emanuel.”Thanks, now how did I miss that, thought I checked all the names…There are Ladies Auxiliary to the Knights, and there need not be Knights at their functions, but I’ve yet to find any photos of them wearing anything extravagant.The Archivist did not mention the names on the back of the photo until rather late in the game, and much speculation as to whether the pages were boys or girls. She has been helpful to me, checking various items, although we are still in the dark.I think the people here have accomplished a major goal, identifying the time frame of the photo as closely as possible, based largely on the dress! From the original range of 1921-1934, I am convinced it is probably (close to) December 8, 1932.This will enable the checking of the local newspapers or parish/diocesan newsletter for a copy of that photo, with some helpful caption!I had hoped the Museum would have the reliquary in its possession, but this does not seem to be the case. Here are the comments from the Father in charge of the Museum:”might have had something to do with the new altar and reredos installed around the end of 1932 in the Cathedral. Might too have been some traveling reliquary. My other guess would be that the photo was taken at a ceremony of translation. These ceremonies are often relatively elaborate, and if the saint or relic had something to do with children (especially girls) then the pages and the young woman herself would make more sense in terms of the male-oriented Catholicism of the time. It might also explain why the priest himself is not vested. The relic also wouldn’t necessarily have to have anything to do with Mary. St Ursula is a patron of girls’ education and has ties to the Germanic roots of the area. If I’m remembering correctly, there are also quite a few relics floating around. Was there something major going on a Catholic school nearby at this time?Best of luck! You might try contacting Colleen Fitzpatrick. http://www.forensicgenealogy.info/She might be able to help in determining the origin, and information. Melissa’s comment about this being a ceremony of translation seems to fit perfectly. I had to look up the term, but it sounds exactly right. Hoping for more help from the archivist or curator. Absolutely fascinating discussion going on here… isn’t it astonishing how much we can tell by looking at one photo and using the resources we have access to? Now, how many of us have photos like this in our posession? Wouldn’t it be fun to figure out ho is who and what they’re doing? There is a searchable index of Allen County, Indian Year Books. All six girls are listed there: Mary Lee Koester in 1939, 40 and 41; Dolores Sorg in 1940, 41 and 43; Betty Eifert in 1940, 41 and 43; Patricia Kilkelly in 1939 and 1941; Mary Emmanuel in 1941; and Clare Kelker in 1940, 41 and 43. A quick look through the year books in the Allen County Public Library might net the name of an organization that all of these girls had in common, besides the Catholic church, that is. I took the photo to our parish priest and he said it could be something to do with a local sodality. Sodalities existed to encourage people to go to Mass once a month.He couldn’t say for certain if the girls were Children of Mary. As an aside, a Child of Mary protected her virginity until she married and then was no longer eligible to remain in the Sodality and would join the Sodality of the Sacred Heart. He also had a rather prosaic comment in that the reliquary may in fact merely be a money box and the lady in the photo is presenting a (sizeable) donation of monies raised. This would tie in with the new altar being built.I was then treated to a delightful conversation when he and the parish secretary took a walk down memory lane. Things definitely ain’t what they used to be!! Thank you everyone here for such an interesting discussion. I know nothing about any of this, but wanted to respond to John about the longjohns … look at the pages 3rd from left and 2nd from right. These two are definitely wearing longjohns under their stockings. It’s been very interesting reading through all of the comments. “Eastern Orthodox churches have both priests and altars. I believe Episcopalians ALSO have priests and altars (though I’m not certain). That is why I asked.”That both groups do. EO altars look VERY different (so does the clerical dress of the priests), and the priest in the photo is known to be a Catholic priest and that altar has been identified as a Catholic cathedral already.You were thinking along the right lines… BUT again, it has already been established to be a Cath. priest at a cathedral. Is anyone considering the period when the picture was taken? 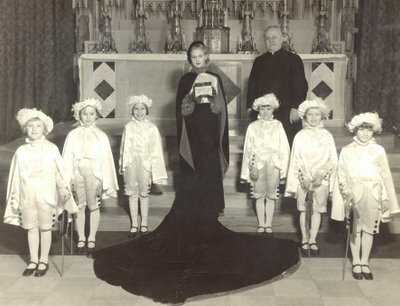 Back then, they had all sorts of pageants and theatricals for children and wouldn’t have had any problem with taking a picture of the participants in front of the altar. It’s bound to be something like that. From a rep of the Daughters of Isabella:”Hello, Our historian has said that she is not sure, but feels it is probably not D of I.Our Lady of Victory Circle #246 started in Fort Wayne in 1923 so it is possible that the woman is a D of I. The key to her identification is what she is holding. It could not be identified. The circle has since closed.The historian suggested that perhaps you could contact the archivist for the Fort Wayne diocese (archdiocese) who probably works in the chancery, the answer might be available there. Find out about the monsignor and about what other organizations were in existence at the time. Hope that helps.Elaine LegerInternational Regent”Daughters of Isabella SEEM to be out. I’m not sure if anyone else said this, but I’m pretty sure those are boy pages, not girls. They look like boys to me, and they’re definitely dressed like boys, and I’m pretty sure the outfits are supposed to look like miniature Knights of Columbus outfits. Back in the day, they really didn’t let females in the sanctuary much, except if they were receiving a sacrament (and that’s where they’re standing). I’m not sure how the woman in the picture rated, but my guess would be that she is donating a relic to the church, and that is what she is holding in her hand. Mary Lee Koester Sosenheimer is my mother. This is a picture taken about 1931. She was a page at a ceremony that persented the key to the pastor for the new tabernacle. She told me a long time ago that she would have rather stayed home that afternoon and played kick-the-can with the neighborhood boys! MYSTERY SOLVED!! !Thank you very much, it has been great fun.